What's that sound? Why, it's the mating call of the Nike Sumo Driver. Here is the fairway wood version. 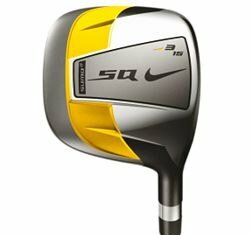 The Nike SQ Sumo2 Fairway Wood is going to bring that same forgiveness (from the oversized square clubhead) to the fairway. Except there is one problem: You don't get to tee the ball up in the fairway! Sorry guys, but I'm not buying it. I understand the appeal of the driver, but with a fairway wood not only are you picking it off the turf, but you might actually miss the fairway sometimes. (I know, shocking!) You are going to need a fairway wood that can hit it out of the rough. Not a big ol' square hammer head. For a forgiving fairway wood that you can hit out of any lie, take a look at the Nickent 4DX Fairway Wood or the Callaway X Fairway Tour Fairway Wood. Both of these clubs have a high MOI and are very easy to hit. I can't guarantee the same lovely "tink," but I think you will like these alternatives.